KUWAIT: Literally meaning ‘Slippery Road’, but the artistic and historic connotation is timeless. This is the essence of ‘Darb Ez Zalaq’; definitely Kuwait’s, and arguably the Arab world’s most popular television series for the last 41 years. The 1977 landmark of a TV show is of the likes, and ranks, of the American war dramedy series M*A*S*H (1972 to 1983) and Britain’s sketch comedy show Monty Python (1969 to 1983); all cemented their reputation as ‘immortal’ in terms of viewership loyalty and diversity, standing the tests of time and tenor. “I, along with Abdulhussein Abdulredha and Abdulameer Al-Turki were called and asked by then minister of information, the late Sheikh Jaber Al-Ali Al-Sabah, to produce an ‘illustrious’ work,” said Saad Al-Faraj, the prominent Kuwaiti actor. “Sheikh Jaber Al-Ali promised unlimited financial support for the series, which would also go on the records as the first to be executively produced,” Faraj told a roundtable on 41 years since the series aired. The trio teamed up and workshopped a plot in the seminal 1970s of Kuwait’s history. It tells the story of Hussein, a teaboy/janitor who comes into wealth after the government buys his house during the housing appraisal period of the 1950s following the discovery and nationalization of oil. Eventually, Hussein’s get-rich-quick schemes and personality leads him to a nervous breakdown and returning to square one financially. “This series could easily last for another 50 years,” said Dr Nader Al-Qannah, drama and theater professor. He explained that most substandard productions nowadays are by private companies, calling on Kuwait TV to reclaim devising dramatic productions, just as it did in the case of Darb Ez Zalaq; which gathered ‘creme du la crème’ of seasoned actors (in addition to Abdulredha and Al-Faraj, there was Khaled Al-Nafisi, Abdulaziz Al-Nimash and Ali Al-Mufidi among other). “Darb Ez Zalaq turned into a comedic competition of some sort, which ultimately contributed in manufacturing situational comedy at its best; rich and side-splitting,” he added. 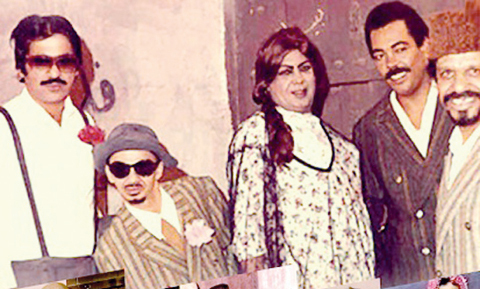 The Hamdy Farid-directed series also succeeded in converging character-based and stereotype-founded dramas, Qannah noted, adding that the series moreover had raised a number of social and moral red flags. “Nostalgia also played, and still is playing a major role, in the lasting success of Darb Ez Zalaq. It is a crucial factor, along with the cast’s collective artistic caliber and spontaneity,” he said.